Wales centre Jonathan Davies and lock Luke Charteris will miss games for their French clubs this weekend, ahead of the Six Nations match against France in Cardiff on 26 February. 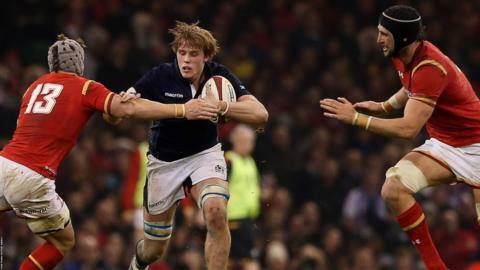 Davies injured his groin and Charteris his knee during last Saturday's 27-23 win over Scotland. Davies will miss Clermont's game against Castres while Racing 92's Charteris will not face Grenoble. Both players will be assessed by Wales' medical staff next week. "I'll be back with the Welsh squad next week and hopefully I'll be good to go," Charteris told BBC Radio Wales. "Hopefully it's all right. I had a bit of a bang in the [Scotland] game in the first half. "There was a bit of swelling in the knee afterwards so I had that drained to try and get the swelling out." Charteris is one of 10 current Wales squad members based in either England or France who have been released for domestic matches this weekend. There are seven members of Warren Gatland's squad at Aviva Premiership clubs - including George North and Jamie Roberts who both scored tries in the win against Scotland. Bradley Davies, who would probably take over Charteris' place in the team if he is unavailable, is at Wasps who play Bath on Saturday.